I am an ecology-minded woman. I appreciate the diversity of life and the way we are all interconnected in one vast biosphere and all that, but there are limits. She’s in a jar, awaiting certain death, and I have no qualms about that. 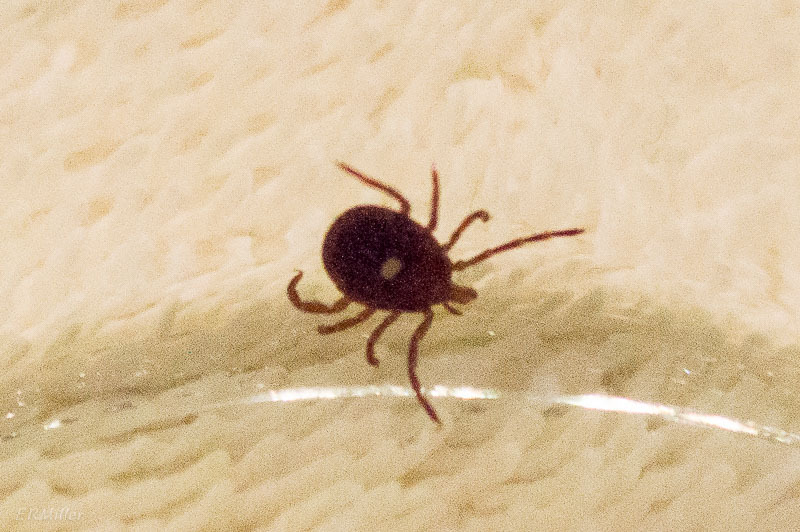 The range of the lone star tick (Amblyomma americanum) is spreading northwards; from what I’ve heard it was fairly uncommon in Maryland as recently as ten years ago. But they’ve been found as far north as Maine, and I can tell you from (painful) experience that they’re quite common here now. The good news is that they don’t carry Lyme disease. The bad news is that they can carry other diseases, such as Rocky Mountain spotted fever and the dreaded meat allergy. If I ever go vegetarian, I want me to make the decision, not some arachnid. They’re described as aggressive biters of humans, at all stages in their life cycles. And the bites hurt. A lot. Protect yourselves. Wear long-sleeved clothing and use bug repellent, and do a thorough check when you’re done outside for the day. Information from the CDC here; identification and other info from tickencounter.org here. This entry was posted in Uncategorized and tagged tick by elizabeth. Bookmark the permalink.